TOKYO (Reuters) - Japan's exports fell sharply in April and manufacturing activity suffered the fastest contraction since Prime Minister Shinzo Abe swept to power in late 2012, providing further evidence that the premier's Abenomics stimulus policy is struggling for traction. They also add pressure on both Abe and the Bank of Japan to do more to rev up flagging growth, even as economists and global investors worry that central banks may be reaching their limits with radical experiments that have yet to kick-start growth. Data on Monday showed Japan's exports fell 10.1 percent in April from a year earlier, the fastest decline in three months as a stronger yen and weakness in China and other emerging markets take their toll on the country's shipments. Imports shrank more than 23 percent, reflecting not only lower commodity prices but stubbornly weak domestic demand that has defied a massive asset-buying program by the BOJ which is now into its fourth year. The decline was likely exaggerated by a drop in U.S.-bound car exports due to supply-chain disruptions caused by earthquakes in Japan last month, but a firmer yen and lackluster global demand are clouding the outlook for 2016. Some analysts fear the economy could contract this quarter after dodging a return to recession early in the year. "Drops in U.S.-bound car exports were noise," said Takeshi Minami, chief economist at Norinchukin Research Institute. "Asia and the global economy remain weak. On top of that, yen gains squeeze profits at exporters, causing wages and capital spending to weaken, which would hamper 'Abenomics' aim of creating virtuous growth," Minami said. Japanese officials recently threatened to intervene in foreign exchange markets to halt "disorderly, one-sided" moves as the yen bolted to 18-month highs, but the United States issued a fresh warning to Tokyo on Saturday against weakening its currency, overshadowing a Group of 7 finance leaders' gathering to discuss how to revive growth. Bank of Japan Deputy Governor Hiroshi Nakaso, while declining to comment on how a strong yen could affect its policy decisions, said on Monday it was desirable for currency rates to move stably, reflecting economic fundamentals. "The desirability of exchange-rate stability is widely shared by the Japanese industry," he said at a seminar. The BOJ is widely expected to expand policy again by July, after shocking global markets by moving to negative interest rates earlier this year. Such a move, along with a possible interest rate hike by the U.S. Federal Reserve, could take some fire out of the yen. Abe is widely expected to unveil an additional budget this summer, and many analysts expect he will postpone a sales tax increase slated for early next year, though officials have publicly said they will press ahead with the plan barring a massive shock to the economy. 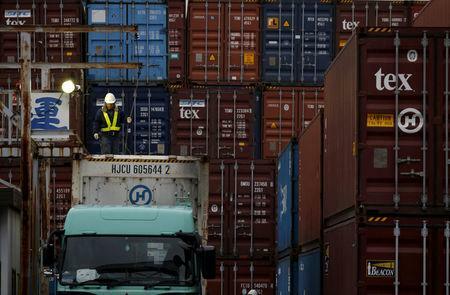 A private business survey on Monday suggested more pain ahead for Japanese manufacturers. The Markit/Nikkei preliminary survey for May showed factory activity shrank for the third straight month while total new orders declined at the sharpest pace in 41 months. Exports to China - Japan's largest trading partner - fell 7.6 percent in April, while the U.S.-bound shipments fell 11.8 percent year-on-year. Car exports to the United States fell 4.4 percent, down for the first time since November 2014. Exports to Asia, which accounts for more than half of Japan's shipments, fell 11.1 percent in the year to April, but EU-bound shipments rose 9.9 percent. Toyota Motor Corp <7203.T> recently forecast a bigger-than-expected 35 percent tumble in net profit for the current year due to the sharp appreciation of the yen, ending three straight years of record profits driven in part by a weak currency. But it still expected global sales to inch up this year. The yen was trading around 110 to the dollar on Monday, pulling back from a high above 105 yen earlier this month, its strongest since late 2014.